A couple of weeks ago I talked about Chenille trending in a big way for this fall. Today I have another beautiful chenille piece for you guys. Our Novelty Multi Color Yarn Long Chenille Cardigan with Fringe is a beautiful piece that you can wear for so many occasions. It is made out of a soft, multi-color chenille novelty yarn. The primary yarn colors are pink and a medium brown but there are specs of turquoise, rust and yellow in there which gives the whole piece more texture and dimension. The body is semi loose and long with two pockets. The front is finished in a self-yarn fringe which is stylish and fun. Since there are multiple colors in this cardigan, you can wear it with many different color tops. For Today’s looks, I have styled it with two tops from our store which both look great with this piece. The first one is our Stone V Neck Long Sleeve Top which I first debuted for you here. 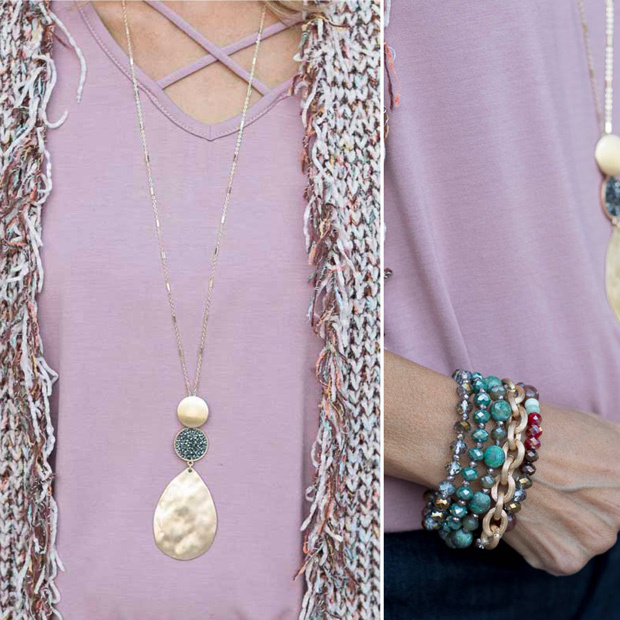 This piece is a great layering piece especially for fall. It is made out of a super soft rayon modal. The body and the sleeves are both long. I have tucked it in the front but you can see the length in the back in some of the photos. The second top I chose is our Mauve Criss Cross Three-Quarter Sleeve Top which is currently on sale! The color looks very pretty with this cardigan. This top is also made out of a soft rayon jersey with the trendy criss cross detail in the front. We actually only have a few of them left so now is a good time! As for accessories for today’s Look, I added a brand-new necklace, our Gold Tone Chain Necklace with Gold and Gunmetal Pendant. This is a simple, yet modern and chic looking necklace and I love the color combo of gold and gunmetal which you can wear with many outfits. I also added two sets of our new bracelets which you can wear separately or together. If combined together, like I have done, they add up to 5 separate bracelets and they look beautiful together. But the best part is you can wear them individually with other bracelets or with just your watch as well. All six pieces I am showing you today are part of our Weekend Flash Sale where you can get 15% off with code FS1117 plus Free US Shipping. All International shipments are a flat rate of $25.00. Love that sweater. The fringe is great. That is a fabulous cardigan! Looks like it is tweed. Fantastic!